Chinchillas can make wonderful pets for the right person, but before deciding on a pet chinchilla, familiarize yourself with their unique characteristics and all aspects of their care. As lovely as chinchillas are, they are not the right pet for everyone. Find out about the unique characteristics of chinchillas, and their pros and cons as pets, to help decide whether a chinchilla is a right pet for you. Avoid taking home a chinchilla that shows common signs and symptoms of illness, stress, or other problems. While some health problems can be hidden, anybody can do a quick check for some common signs of illness or other problems. While there are no guarantees, avoiding chinchillas with obvious signs of problems gives you have the best chance of taking home a healthy chinchilla. Since many diseases are contagious, it is safest to also avoid chinchillas with cage mates that seem ill. As a bonus, you can also get clues about a chinchilla's temperament while doing a quick health check. Being active animals, chinchillas need a large, roomy cage, ideally with multiple levels. It's best to have a cage set up and ready to go before you bring your chinchilla home to make the transition to your home that much easier. In addition to the cage, you will need accessories including a nest box, water bottle, dust bath, and some toys to chew. Chinchillas need a good-quality diet meant for chinchillas to stay healthy. Their digestive system is designed for foods very high in fiber, so a good high fiber diet and plenty of grass hay is the cornerstone of a good chinchilla diet. Feeding them an inappropriate diet can cause serious digestive upsets and health problems. Treats can be used with careful moderation; like some people, chinchillas have a sweet tooth and may prefer to eat things that aren't good for them. 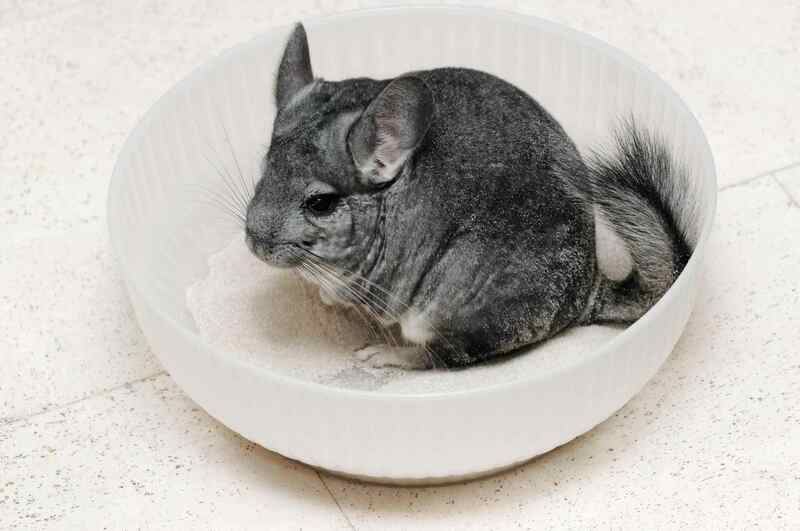 It takes regular dust baths to keep your chinchilla's thick, soft fur in good condition. Chinchillas should never be bathed in water. The fine chinchilla dust provided for a dust bath penetrates the thickness of the chinchilla's fur and absorbs oils and clears away dirt. Not only do dust baths keep their fur in tip-top shape, but chinchillas also seem to enjoy having a vigorous dust bath. It can take some time to get any chinchilla used to your hands and being handled, especially if they are older and haven't been handled much. Some chinchillas will never really like to be held much (they'd rather be exploring, or they may prefer to climb on you rather than being restrained), but being able to handle and interact with your chinchilla will make your relationship with your chinchilla extra rewarding. Chinchillas like to chew, run, jump, and hideout. These favorite activities can be kept in mind when choosing chinchilla toys. Providing a good variety of chew toys is not just fun for your chinchilla, it also helps keep their teeth in good conditions. Many chinchillas also enjoy a wheel, but it is extremely important to choose a safe wheel large enough for chinchillas. Chinchillas love to explore, but they are very curious and biting into objects to see if they are edible. The natural curiosity of chinchillas means that you should have a room that is thoroughly chinchilla-proofed before allowing time outside the cage, and close supervision is necessary. A handy checklist and tips about chinchilla-proofing can help keep your chinchilla safe. Also, consider other pets you may have in the home.